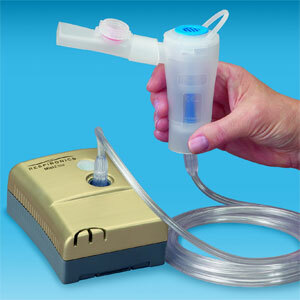 The small and lightweight MiniElite compressor is easy-to-use and provides efficient nebulizer treatments. This stylish, elegant compressor provides portability and can be powered by three versatile power source options – AC, car adapter and battery. The optional rechargeable lithium ion battery operates the MiniElite compressor for up to 90 minutes between charges. This battery technology offers easy and fast re-charging in a lightweight design. The MiniElite compressor weighs less than 1 pound and less than 1.4 pounds with the optional battery attached. "The patient-friendly design of the MiniElite fits the lifestyle needs of patients," said Matt Conlon, Director of Sales and Marketing for Respironics Respiratory Drug Delivery business, "while meeting homecare providers need for cost effectiveness and product reliability."